Based on Joyce Meyer's bestselling book Power Thoughts, this devotional introduces 365 daily devotions to help readers tap into the power of the mind and mouth. 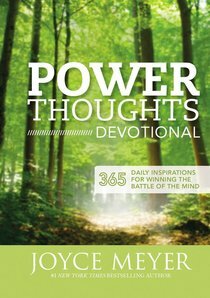 Power Thoughts Devotional will provide you with life-changing declarations of truth directly from God's Word to think and speak over your life every day of the year. About "Power Thoughts Devotional (Large Print)"
Customer Reviews For "Power Thoughts Devotional (Large Print)"
I have read a number of Joyce Meyer books and this is the devotional that reinforces the power thoughts book. They are short one page, but powerful devotionals with each day finishing with a positive power thoughts. This reinforces the positive thinking creates a positive uplifting attitude and how the words we think and say can change our day and our life.